Early history examines the archaeological record that tells the story of the first inhabitants of Utah. Learn about the prehistory and culture of the first early inhabitants, and what lessons it might teach us about the early history of Utah. 9,000 BC to about 5,500 BC Paleoindian - Clovis, Folsom, Great Basin Stemmed, Foothill-Mountain and various late Paleoindian styles. Big and small game hunters, collectors, foragers. About 5,500 BC to about 1000 BC Archaic - Foragers and collectors, Increased use of plants; diversity of site and tool types; desert and marsh adaptations; use of pit houses; use of caves like Danger Cave, Cowboy Cave, Hogup Cave, grinding stones and seed processing. Split-twig figurines. Small family bands of hunters and gathers, very complex social and religious organization. Well adapted to live in harsh environment. Gate Cliff Series Projectile Points, Elko Series Projectile Points, Pinto, Northern Side Notched Points. About 1000 BC to about 1300 AD Formative Late Prehistoric - Anasazi, Fremont Pit house Villages, Cliff Dwellings, Elaborate Architecture variety of ceramic styles, Farming: corn, beans, and squash. Utah's intriguing history dates back to the Messozoic Era (230 to 65 million years ago), when many types of dinosaurs lived in the eastern and southern parts of what is now known as Utah. Their fossilized remnants are still being discovered and unearthed. Utah's prehistory is as diverse as its scenic landscape, covering 10,000-12,000 years. Archaeological sites have been identified in all corners of the state. This shows that the ancient people of Utah adapt well to deserts, high mountains, badlands, and marshes. Archaeologists call the first people living in Utah "Paleoindians" (pa-leo-in-de-en). The Paleoindians were hunters and gatherers who sometimes hunted now-extinct mammals like the mammoth. All across Utah, Paleoindian sites are found. These sites are very old and rare. Some Paleoindian camps identified along the shoreline of ancient Lake Bonneville reflect Paleoindians use of marsh environments. Changes started in weapons and lifeways around 8,000 years ago. This marked the beginning of the Archaic period. During the Archaic period, people were hunters and gatherers. They were nomadic (no-mad-ik), but sometimes they settled in small villages and caves for short periods. During the Archaic period, people made a variety of baskets for collecting plants. They made many types of stone spear and dart tips. They used these to hunt animals. From 8,000 to 2,000 years ago the atlatl, or spear thrower, helped the people hunt successfully. Danger Cave and Juke Box Cave near Wendover, Utah are two famous sites used during the Paleoindian and Archaic time periods. Americans in Utah. They call them the Anasazi (ane-sa-ze) and Fremont Indians. Farming changed the way Anasazi and Fremont Indians made a living. Across much of northern Utah, the Fremont adopted a farming lifestyle. They still relied on hunting and gathering for much of their food. Further to the south, in the Four Corners area and across the southern portion of Utah, the Anasazi relied heavily on corn, beans and squash. The Anasazi had domesticated (de-mesti-kat) the turkey and used it as an important source of food and raw material. Around 1300 BCE. (Before the Common Era), the people we call Fremont and Anasazi were no longer visible in the archaeological record. Some areas were abandoned and new cultures moved into the area. In many ways, people went back to a hunter and gatherer lifestyle or the same type of lifestyle that the people in the Arachic period lived. Utah has five historic Indian tribes including the Ute, Paiute, Navajo, Goshute, and Shoshone. They all had different ways of living successfully in Utah. Native American groups living in Utah included the Ute, Southern Paiute, Navajo, Gosiute, Northern and Eastern Shoshone. The Ute, Paiute, Gosiute, and Shoshone speak different but related languages from a family known as the Numic Language Family. The Navajo speak a language that is in the Athapaskan (ath-e-pas-ken) Language Family. The Ute, Goisute, Southern Paiute and Shoshone lived similar lifestyles by hunting, fishing, and gathering wild plant foods. The pinyon nut was especially important to all of them. These groups now live on reservations in Utah, Colorado, Nevada and Idaho although prior to white settlement, they ranged all across the Great Basin and Intermountain West. Navajo culture during historic times was based upon herding sheep, goats, and cattle. 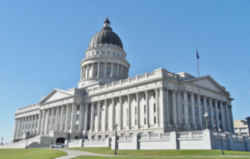 The state of Utah is named after the Ute tribe. The Ute once held claim to much of Utah and all of western Colorado. They ranged well onto the Great Plains of eastern Colorado into Nebraska and south into New Mexico. In historic times, there were at least 11 different bands of the Ute tribe. Each band claimed their own territory but membership in a band was fluid. 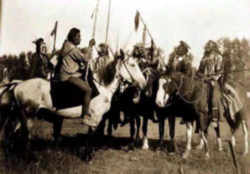 The Ute lived by hunting, fishing, gathering and trading with other Native American groups in the area. Housing consisted of brush structures and cone-shaped tipis made from animal skins. During the late 1800s, the Ute lost most of their lands and were restricted to reservations in southern Colorado and northeastern Utah. The Paiute are divided into two groups: the Northern Paiute and the Southern Paiute. The Northern Paiute lived in what is now Oregon, California and Nevada. The Southern Paiute lived in southern Utah, southern Nevada, and northern Arizona. Hunting and gathering with some fishing was the main source of food. A Southern Paiute house might be made of brush and poles stacked in a cone-shape. These are known as wickiups (WIK-ee-up). Basketry was made by the Southern Paiute as was pottery. There are Paiute reservations in southern Utah and in Nevada. The western deserts of Utah is the home of the Gosiute. They are related to the western Shoshone groups and, through intermarriage, to the Ute. The Gosiute lived in the Great Basin as hunters and gatherers living. They built cone-shaped wickiups and similar structures. Two reservations in western Utah are now the home of the Gosiute. Idaho, eastern Oregon and northern Utah was the home of the Northern Shoshone. The Eastern Shoshone lived across western Wyoming, northeastern Utah, and northwestern Colorado. Shoshone livelihood revolved around hunting, gathering and fishing. Bison hunting was especially important. Herding sheep and goats was, and still is, the mainstay of many Navajo families. Southern Utah, northern Arizona, and northern New Mexico is the land of the Navajo; the largest Native American tribe in the United States. Some people believe the Navajo migrated south into their current homeland sometime after 1300 C.E. (Common Era) where they lived as hunters and gatherers. At some point, the Navajo acquired sheep from the Spanish and they learned to weave from the Hopi. The Hogan is the traditional Navajo house. Clothing: Wore long dresses, skirts, trousers, and moccasins made from buffalo hides. Way of Life: Groups of 200 divided into smaller family groups. Women made clothes from animal skins. Men spent most of their time hunting. Food: Gathered seeds, plants, and roots. Farmed corn, squash, beans, sunflowers, wheat, and melons. Fished, hunted small animals. Shelter: Wicki-up in the winter and nothing in the summer. Woven baskets used for storage, carrying water, hats, trays, and bowls. Food: Dug for roots, gathered berries, seeds from grasses and pine trees. Used a bunch of different plants. Caught birds, crickets, mice, rabbits, insects, and lizards. Shelter: Wicki-ups in the summer, caves and rock shelters in the winter. Clothing: Wore little clothing and had rabbit-skin blankets. Way of Life: Small family groups. Spent most of their time gathering food. Food: Gathered roots, seeds, and pinyon nuts. Fished, hunted small animals. Raised corn, squash, and beans. Clothing: Animal skins for clothes and blankets. Way of Life: Small family bands. Made baskets and some pottery. Food: Planted corn, beans, and squash. Hunted rabbits, prairie dogs, deer, and antelope. Clothing: Animal skins and wool. Way of Life: Close family group organized around the mother or grandmother. Weaved, farmed, silversmithed, and raised sheep and goats.